The Intel X299 Motherboards function on the LGA 2066 socket. These motherboards support Intel Kaby Lake X and Skylake X ranges of motherboards. Making them essentially a must-have for anyone wanting to use the highest performance processors right now. Aside from the fact that you’ll need one of these high-end motherboards to run these processors, they also provide unparalleled abilities for crossfire or SLI. Offering as many as 44 PCI-E 3.0 lanes in some units. This is just absolutely insane, so we’ll say it again… 44 PCI-E 3 LANES. WTF! We’ve wrote a lot before about different motherboards, having reviewed the best z270 boards last month, and our best motherboards for gaming guide, this article is a continuation of that effort to help you pick the best motherboard for your gaming needs. Basically, if you want the most powerful motherboard you can get and something that is the next step up from the Z270 then this is where it’s at. The X299 motherboards were initially released early, this meant they were fraught with problems during the initial release. Luckily, time has passed and mistakes have been addressed. The motherboards have now matured and really reached the point where they’re worth taking a look at again. In this list we’re going to suggest the best of the bunch, including the best high-end, best for those on a budget etc. Ultimately as with all our reviews we focus on the few quality options, so any of these boards will be fantastic for your gaming needs. So check it out! As with most motherboards in the X299 range, this board first and foremost looks smart and expensive. Making it a dream for any cosmetically inclined gamers out there. Most importantly though, for the price this board runs extremely extremely well. Considering the early teething issues with the X299 mobo tech out there, this surpasses any of the ROG RAMPAGE motherboards that ASUS have built before. Including everything you’d expect, but having some intense capabilities packed in. x16 four-way SLI? No problem, this is the beauty of the X299. All that being said, this board is costly as hell. Even though it’s the best we’ve seen on the market, it’s simply not going to be affordable for most. Couple that with the insane capabilities of this board, and you’re going to need to upgrade your PSU. Especially if you’re doing SLI or Crossfire. We’d suggest 750w as a minimum for a two-way SLI or Crossfire. This board is extremely worth it PROVIDED you have the budget. I wouldn’t ever put a luxury, high-end motherboard at the top of my list unless I could afford all of the other components to truly make the most out of it and nor should you. That being said, for an X299 motherboard we’ve heard nothing but good things about this board. Reliability is sound, overclocking ability is a dream. Generally the only negatives we’ve been able to find is that it’s a little complicated for those who aren’t used to building and configurating their own systems. This is the best pick for those looking for the absolute top of the range high-end X299 motherboard as of right now in late 2017. The MSI X299 Gaming Pro X299 Mobo is a great motherboard for those who are looking for a happy medium, offering good performance and it’s super cheap for a HEDT platform. Overall the motherboard has a lot to offer for casual overclockers and gamers wanting to make use of either the Skylake-X or Kaby Lake-X processors. Which is certainly a plus over the ASUS RAMPAGE as it only supports Skylake-X. For this reason alone this is the best Kaby Lake-X X299 motherboard on our list, and the best that we’ve actually been able to take on a test run ourselves. The performance as we said is solid, and seems very reliable under stress-testing our own components. The main issue with the motherboard is it’s not as forgiving with high-speed memory. This can be a downside, and you’ll need to dig into the technical specifications and reviews to make sure your memory will be a good fit. Overall it does everything you’d expect of an X299 motherboard, offering plenty of options for Crossfire and SLI configurations. Overall this board is definitely worth it, it’s not sickeningly over-priced for what it is and it supports both the -X processors from Intel. This is the best pick for those looking for the most versatile mid-range X299 mobo for gaming in terms of performance and options. As we said the only real downside is it being picky with memory. 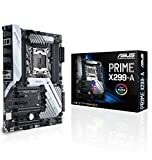 Top of our list is the ASUS PRIME X299-A. This board is extremely competitive for the price, making it a great budget option. In terms of performance it was more than capable of handling everything we threw at it, comparing favorably to the MSI X299 PRO. Stability is the name of the game with this board, while others in the X299 range are in some way trying to set themselves apart, this board instead chooses to do the few things it does well. Any long-term readers of the site know that we’re big fans of motherboards that offer great stability for a gaming setup as longevity is a goal we should all aim for even when building high-end systems. Overall it’s not as fussy with memory as the previous board, but it’s still not able to handle the really higher end frequencies you throw at it. Sticking to DDR4 3200 MHz max is probably a good idea. There’s not a lot else to say about the board other than the fact that we were really impressed with it, as we felt for the price it exceeded our expectations and we’d definitely recommend it to anyone looking to upgrade to these lines of processors without breaking the bank. For a board that focuses on stability and reliability as well as offering the baseline requirements for the X299 socket, we’d give this a huge thumbs up and say it’s more than worth it given the price. This is the absolute BEST choice for those looking to get the top budget option for the X299 mobo-range. We’ve been on a mission here to review and recommend the best motherboards for gamers with any build or budget in mind, and it’s been truly mind-boggling to test out some of these motherboards. It’s impressive how far things have come, and while we don’t expect these motherboards to become as widely adopted as the Z270s we do think they’re worth it for anyone looking to build something new right now, or for those of you looking to simply have the edge at all times on the competition. Make no mistake, these boards are not the joke they were when they were first released. They’re a serious bit of hardware for serious gamers.